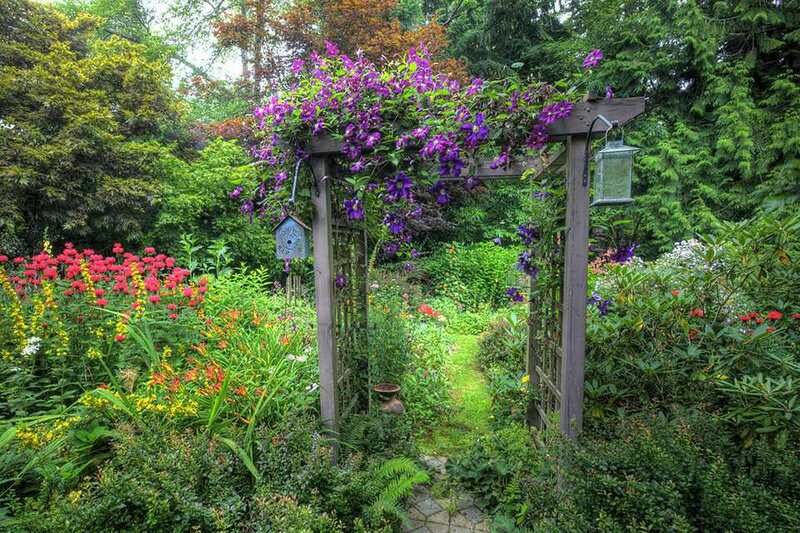 Even a small garden arbor can be expensive if you buy it prebuilt or hire a landscape carpenter to build it according to your specifications, but fortunately, this is one of the easiest (and cheapest) of do-it-yourself projects for the landscape. Our design calls for a simply two-post structure, ideal for farming a walkway or providing an overhead shelter for a garden bench. The design is quite simple: two vertical 4 x 4 posts; a pair of horizontal 1 x 6 "joists" sandwiched around each post at the top; a series of 2 x 4 "rafters" spanning the joists and running perpendicular to them; and finally, 2 x 2 lattice strips running across the rafters. The result is overhead screening structure that offers pleasing dappled shade or a base to support a canopy of vines. It will take the average do-it-yourself landscaper two days to build this garden arbor, but much of this time is taken up with allowing concrete post foundations to dry. There is only a few hours of actual labor involved. This simple design could easily be adapted to a larger arbor with four posts, suitable for covering a small patio or deck. Sandwiching pairs of 1 x 6 crosspieces ("joists") around each post at the top. Installing 2 x 4 "rafters" to span across the sandwiched joists. Installing 2 x 2 lattice strips over the rafters, aligned so they are perpendicular to the rafters. The amount of lumber you'll need will depend on the size of your arbor, so exact measurements are left unspecified. It's a good idea to sketch out your arbor on paper to get a clear idea of just how much lumber you'll need. Make sure to choose lumber that is resistant to decay and insect damage. The least expensive alternative is pressure-treated pine, which has been impregnated with chemicals to hinder decay and insect damage. Pressure treated lumber can be painted or stained after a short period of drying. Other, more expensive alternatives include cedar or redwood, both of which have a natural resistance to decay. The first step is to locate and dig holes for the posts. Spacing can vary, but with this small, simple design, it's wise to space the posts no more than 4 to 6 feet apart. For sturdiness, it's best to embed your posts so at least 2 feet, and preferably 3 feet, is embedded in the ground. But always check with your local building inspection office to learn if there are requirements on post depth. Follow whatever standard practice calls for in your area. Mark the position of the posts on the ground. Using a post-hole digger, dig holes to the desired depth for the post foundations. Place several inches of gravel in the bottom of each hole to assist drainage. The most important (and most difficult) step in the project is getting the posts installed correctly so that they are perfectly upright (plumb) and solidly anchored. Take your time on this part of the project. A helper can be very useful at this stage of construction. Cut 4 x 4 lumber to length for the posts, including the portion that will be underground. Most carpenters choose to cut posts a little longer than needed, then trim the tops of the posts to the proper height at a later stage of construction. Position the posts in the footing holes. Mix concrete in a wheelbarrow or mortar box. Consistency should be dough-like—not too wet, nor too crumbly. Have a helper hold the post upright (or stake it in place), then shovel wet concrete into the hole up to ground level. As you add concrete, check the post with a level to make sure it remains perfectly upright (plumb). Lightly tap the side of the post with a hammer; this will settle the concrete and eliminate any air pockets. Once the post is positioned properly, avoid touching it as you proceed to the other post. If the post wobbles or will not stay upright, you can anchor it with diagonal stakes attached with screws. Repeat steps 1 to 6 for the other post. As you install the second post, it is critical that you install it so the front faces of both posts are aligned. A long straightedge board can be used to ensure that the faces of the posts are aligned. When both posts are installed, allow the concrete to dry overnight. Take care to prevent the posts from being bumped or moved as the concrete dries. Note: In some areas, it is standard practice for posts on fences, arbors, and other outdoor structures to be anchored by packing gravel around the posts rather than using concrete. You can do this if you want, but remember that an arbor may be subject to winds, and the sturdier the post footings, the more secure your arbor will be. The joists for your arbor will consist of a pair of 1 x 6s sandwiched around each of the posts near the top. Note: If you want, the ends of the joists can be cut to a decorative shape—either angled geometrically or cut to a curved or rounded shape with a jigsaw. Cut four pieces of 1 x 6 lumber to the desired depth of your arbor. The size is up to you, but for a small two-post arbor like this one, the joists should be no more than 4 to 5 feet long. Measure up from the ground along each post, and make a mark indicating the bottom of the joists. This measurement, too, is up to you, but 7 feet or so is ideal, as it gives enough room for people to pass beneath. Position and temporarily screw the joists to the posts, taking pains to make sure they are perfectly level and uniformly aligned with one another. Use a long straightedge and level to ensure that the pairs of joists are level from side to side. When the joists are positioned as you want, drill a pair of 1/4-inch holes through the posts and sandwiched joists, then insert lag bolts through the holes and secure the three layers together with washers and nuts. Each joist pair should be secured to its post with two bolts. If the posts are extending up beyond the tops of the joists, you can cut them off flush, using a handsaw, jigsaw, or reciprocating saw. This arbor design calls for five 2 x 4 parallel rafters to span across the joists, overhanging slightly on each side. Here again, the exact rafter length is up to you, but generally, the rafters should not overhang the outside of the joists by more than about 1 ft. This design calls for a custom feature in which the rafters are notched to fit down over the joists. Cut five 2 x 4 rafters to length. Position the first rafter across the tops of the joists so the overhang is uniform on each side. Outline the location of the sandwiched joists on the edge of the rafter. Take the rafter down and mark the face for 3/4-inch wide x 1 1/4-inch deep notches at each rafter location. Use a handsaw or circular saw to make the depth cuts for each notch, then use a chisel to remove the wood and complete the notch. Repeat this process with each of the remaining rafters. Position the five rafters onto the joists, tapping them down so the joists are fully embedded into the notches. Make sure the rafters are evenly spaced along the joists. From above, drive 2 1/2-inch deck screws down through the top face of the rafters to secure them to the 1 x 6 joists. The final step is to cut and attach the 2 x 2 lattice strips as the top architectural layer above the rafters, installed so they are perpendicular to the rafters. The spacing and number of strips are up to you, but generally, a gap of 6 inches or so is ideal. Cut 2 x 2s to length for the lattice strips. They can overhang the front and back rafters by up to 6 inches if you wish. One by one, position the lattice strips and attach them to the rafters with deck screws driven from above. If you have built your arbor from pressure treated wood, you should wait at least six months before staining. Because of the wait involved, you won't be able to plant any vines on it for that first summer. If you've built from cedar or redwood, staining isn't needed, and you can plant immediately. There's "Landscaping," and Then There's "Interiorscaping"